In a large pot over medium heat, saute the chicken in the oil for 5 min. Add the garlic & cumin and mix well. Then add the broth, corn, onion, chili powder, lemon juice, & salsa. Reduce heat to low and simmer for about 20-30 minutes. Break up some tortilla chips into individual bowls* and pour soup over chips. Top with cheese and a little sour cream. * We used the chips to eat the soup (instead of spoons) rather than break them into our bowls. 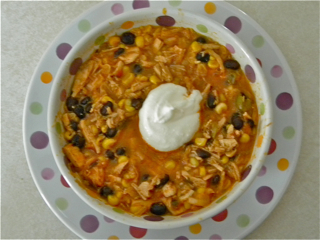 NOTE – The recipe doesn’t call for it, but we added one can of black beans – drained and rinsed. I also added a can of drained & rinsed black beans! Forgot to add that.